September 11, 2006 was the day of Microsoft’s TechNet roadshow in Bahrain. To Bahrain’s IT pros, this meant an exciting opportunity to interface with Microsoft’s experts and take a peek at upcoming technology. 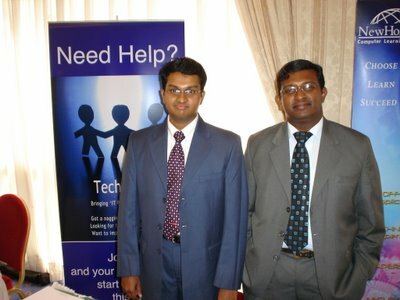 To me and my pal Arun, this was an opportunity to showcase our new IT Pro user group — “TechLinks” – the first of its kind in Bahrain. Mohammed Arif of Microsoft Dubai helped us get a stand in the foyer. With a feeling of excitement, we rubbed our hands together and got to work. We reached early and put up our little banner and distributed membership forms to visitors and explained them what the group was all about. Most the visitors who signed up were just curious, wanting to know what’s going on. Some of them were passionate and expressed their joy in seeing a community taking shape — some even gave us some insight on what kind activities they’d like see in the group! Overall, I’d say it was successful — We did get a good number of members. After we got back home, we tabulated the member data and sent e-mailers to each member so that they can register on the online community as well.